I decided to have my front end powder coated, which meant everything had to be completely taken apart, including removing the bushings from the rocker plates. When the rocker plates returned from powder coating I would need to install new bushings, so I designed a tool to do both jobs. 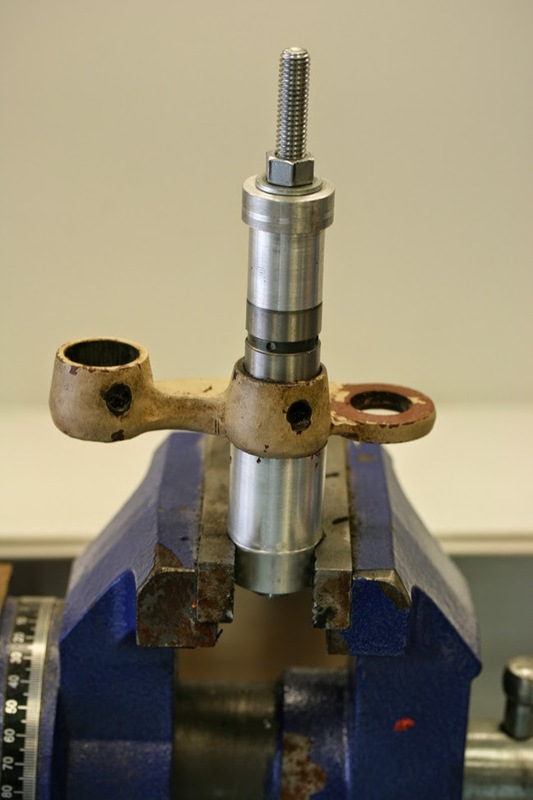 My basic design was to build a two piece tool that could be mounted in a bench top vise and used a 1/2" bolt to press out and press in the bushings. I carefully measured the dimensions of my new bushings and then set to work on the lathe. The lower half of the tool was made with a piece of 1.25" diameter aluminum round bar stock. Using a 33/64" bit, I drilled approximately 2.25" into the end of the bar. This may sound like an odd size, but it provides enough clearance for a 1/2" bolt to move freely through the tool. Step two was to bore out the end of the bar to a diameter of 0.99" and a depth of 1.25". 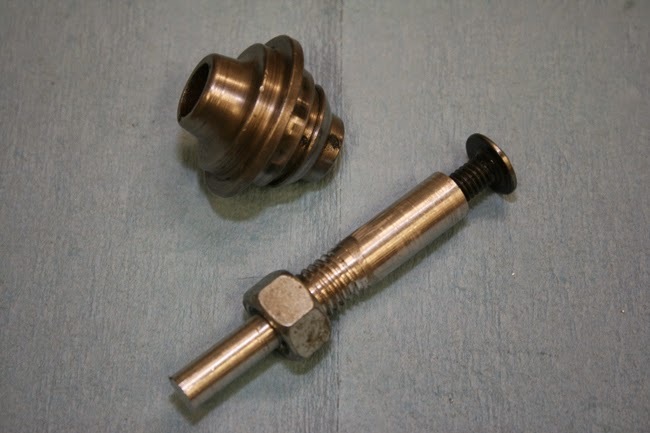 This created a pocket which would catch the bushing as it was being pressed out of the rocker plate and still provide a surface for the rocker plate to press against. The last step was to cut the bar off at 2". If your friend also has a mill, you can cut a couple flats at the end of the bar to make it easier to hold in the vise. 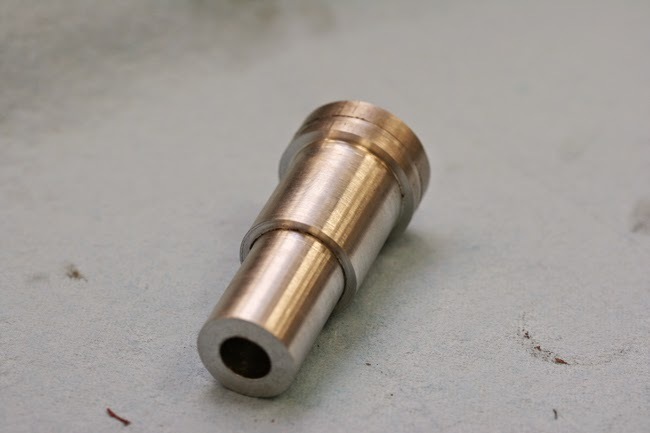 The result is visually similar to a standard 1/4" drive socket. The upper half of the tool was also made with aluminum round bar, but I started with a 1.125" diameter piece to save time. This half needed to be a little longer, so using the same 33/64" bit, I drilled to a depth of 2.75". Now I turned the rod down so that it had three different diameters. The end of the bar was turned down to .7480" to fit inside the bushing. The total length of this section was 1.03" making the tool slightly longer than the bushing with was 1.00" in length. The middle section was turned down to .934" which created a shoulder to press against the lip of the bushing, but was still narrow enough to pass through the rocker plate. The length of this section was also 1.03" to make sure that the bushing was pushed completely through the rocker plate. The end of the tool was left at the original 1.125" diameter and cut to an arbitrary length of 0.42". Once the two parts were finished, I just picked up a 1/2" bolt that was 6" in length and completely threaded, one 1/2" nut and two 1/2" washers. Here's how it looks all assembled and mounted in the vice. 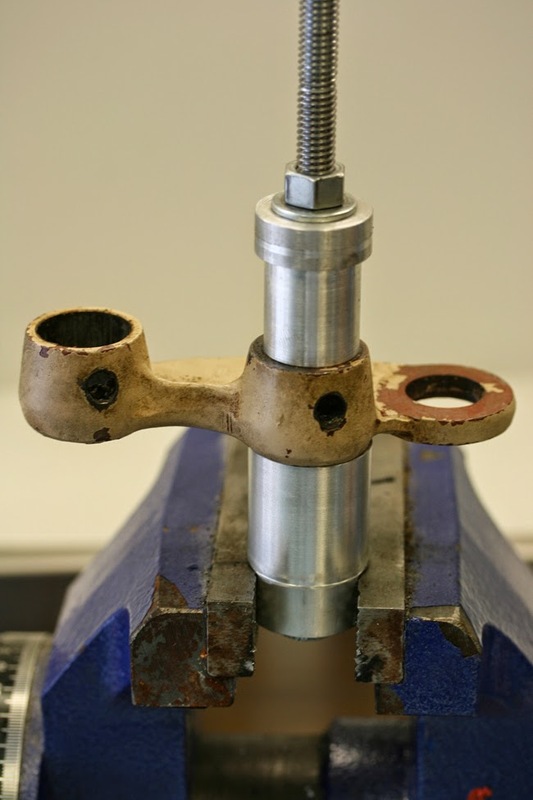 To press out the bushing, you simply tighten down the nut with a socket wrench. Installing the new bushing is just as easy. 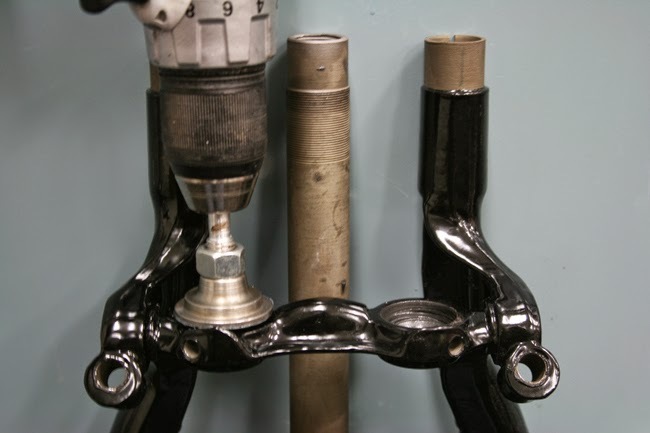 The only difference is you have to slide the bushing onto the upper half of the tool before assembling it. Important tip: Note that one end of the busing has a slight taper cut into it. This is the end that needs to be pressed into the rocker plate first. 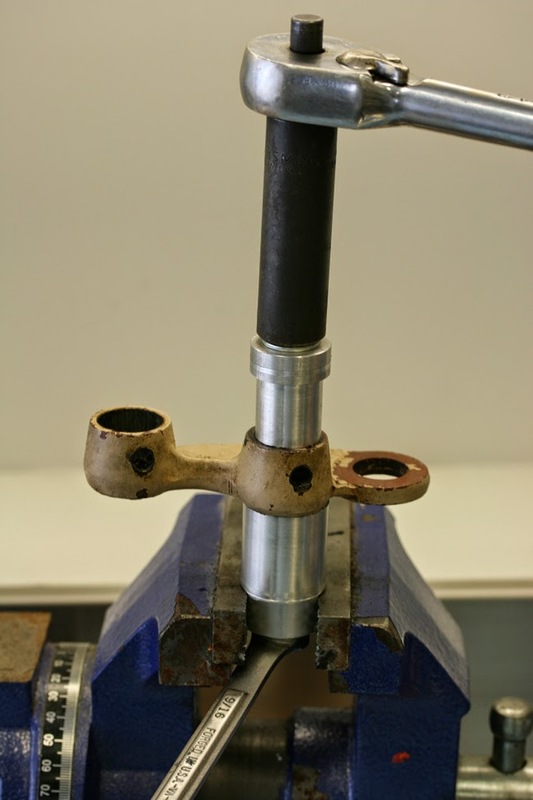 I built a similar tool to replace the bushings in the front brake shackle adjusting the overall dimensions based on my measurements of the replacement bushing. The third tool was designed to remove excess powder coating which was causing a fitment issue with my spring rod bushings. I decided the best way to clean out the excess powder coating without damaging the rigid fork was to use the original spring rod bushing and some valve grinding compound. To speed things along, I attached the spring rod bushing to my cordless drill. Starting with a piece of 0.5" aluminum round bar, I drilled and tapped the end to allow a 5/16" flange head bolt to be screwed into the end. This kept the the spring rod bushing from sliding off the end of the tool. Then I moved down the bar 2" and turned down a 1" section to 0.35" in diameter. This narrow section goes inside the drill chuck. 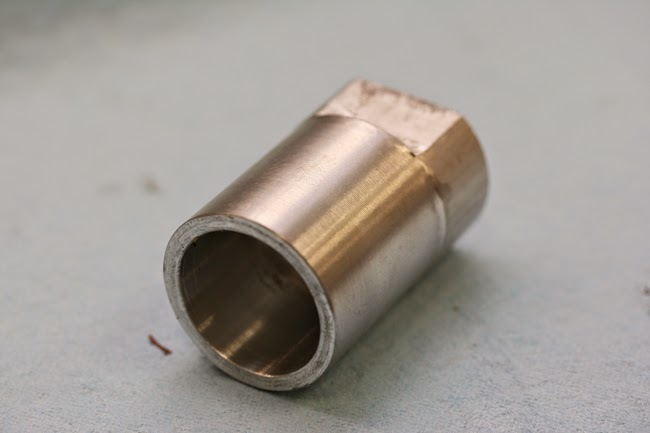 To keep the bushing pressed tight against the flange head bolt, I threaded a section 0.75" long with 1/2" coarse threads allowing me to use a 1/2" nut to press up against the other side of the spring rod bushing. Here it is chucked up in the drill and ready to start grinding. A little valve grinding compound and the drill does all the work. 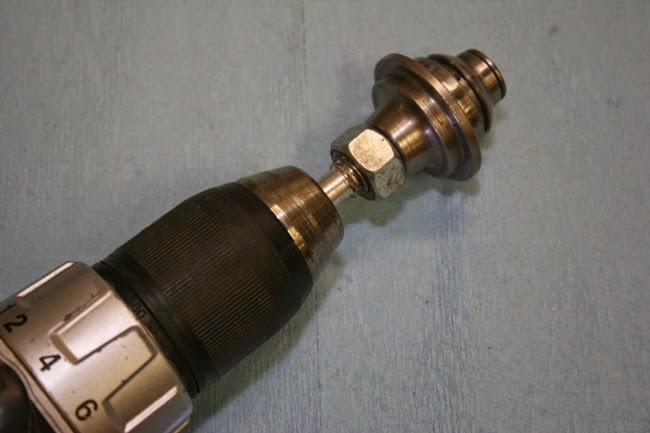 These designs are basic enough that anyone with access to a lathe can make them. 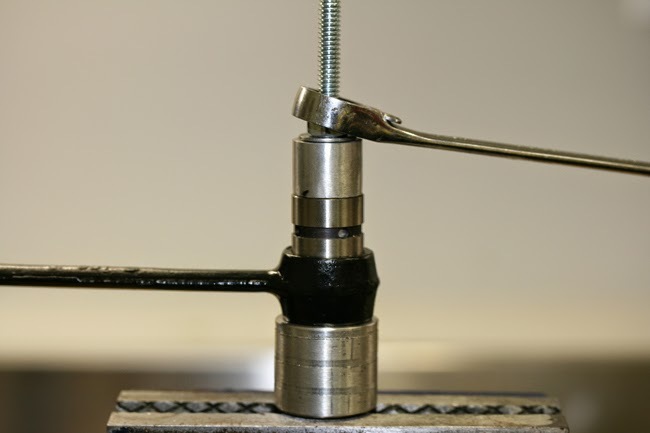 Always remember to verify the dimensions of your bushings and adjust the design of the tool as needed. It's always easier to go back to the lathe and take off more material than it is to add material back on.